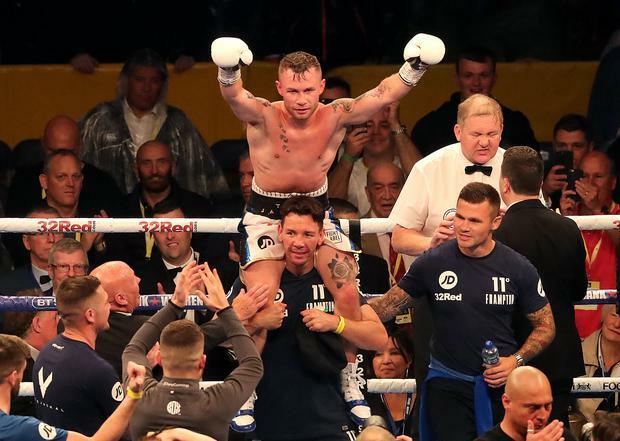 Carl Frampton turned on the style in front of his home crowd in Belfast as he beat Australian Luke Jackson to defend his WBO interim World featherweight title. Crunching body punches and some great combinations allowed Frampton to outclass Jackson, with the Aussie's corner throwing in the towel in the ninth round. Jackson's left eye was swollen shut by the time he was put down in the eighth by a powerful left hook to the body and the local hero sensed victory was in sight. With little to defend himself from, Frampton began to target the Australian's head with both left and right hands, and with Jackson struggling to remain on his feet his corner rightly threw in the towel. "The atmosphere was special, you made my dreams come true," said Frampton as he addressed the Windsor Park crowd. "I was having a meal with my wife Christine before the fight and I was nervous. I was trying to eat a wee but of chicken and I was nervous, my hand was shaking. "I was happy with the performance and felt comfortable. I felt fresh but felt I was trying to land the perfect shot at times." Frampton's promoter Frank Warren confirmed a fight with British IBF world champion Josh Warrington will now take place at some point in the coming months. "We have Josh Warrington in the ring here, we are both with Frank Warren and hopefully we can make a fight. 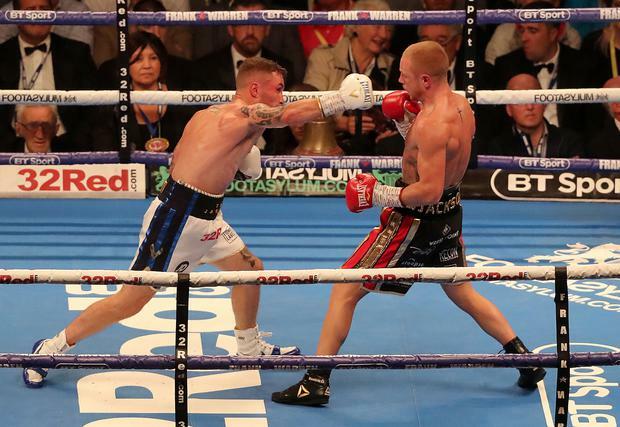 I'd love to be a world champion again," added Frampton. "I know myself I still have it but I have to prove it with performances like that. Warrington is a different fight all together I know that. I want it and it's an easy fight to make. It makes sense." Warrington got in the ring with Frampton, and their promoter Warren said: "We are now going to make the dream fight. These two guys in the ring together is a dream fight for the fans and we are going to make it happen. It will happen, definitely this year." Frampton said: "Hopefully he can make the fight. I'm not for a second saying I'm a world champion because I have this interim (IBO) title. Josh is a world champion and I would love to be a world champion again. "That fight is the easiest to make. He is here, so he's keen, and I'm as keen as mustard, so let's do it." Warrington said: "I'm looking to get the fight - for me, I beat (Lee) Selby and I'm still ranked behind Carl, so I'd like to be number one for Christmas."